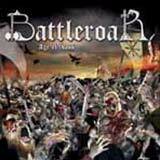 One quick look at the name of this band, Battleroar, and you’ll know exactly what you’re in store for with this album; epic true/battle metal. This album has that raw, 1980’s underground sound quality ala Manila Road. The style of epic metal they are playing is also very similar to Manila Road, and also Jack Starr’s Guardians of the Flame. Naturally, there are lots and lots of lyrics about brave warriors, battles, swords, and the like. Age of Chaos is this Greek band’s second album, a follow up to their 2003 self titled debut album. Strangely, the album starts off with the subtle, acoustic track, The Wanderer. However, none other than Manila Road’s Mark Shelton handles vocal duties on this track. Albeit a laid back and melodic track, it definitely manages to set the tone and atmosphere for the rest of the album. Vampire Killer follows up, with this being a more accurate sample of what the rest of the album sounds like. Galloping riffs, accompanied by big, Maiden-esque leads pave the way for the music on this album. Some acoustic textures are sprinkled throughout the album to aide in creating that epic feeling. Whatever amps Battleroar is using, I would suggest they stick with them. The guitar work on this album hits the nails perfectly on the head as far as achieving a genuine 80’s true metal sound. Having said that, the album is produced well enough to have a clear, well balanced sound, but not overproduced to the point that it loses its 80’s underground character. That’s just the right middle ground for an album like this. The atmosphere of this album is a big plus for me. Lead vocalist Marco Concoreggi’s voice can definitely be characterized as an acquired taste. His delivery is very epic in nature; thus his style is perfect for this type of band. However, the tone of his voice and enunciation is strange. Also, I noticed a few spots (mainly when he tries to sustain and hold a note) where he is slightly off key. It’s not enough to damage the listening experience, but you may want to catch a sound clip if you can to see if this “acquired taste” vocal delivery is up your alley or not. After about 3 listens to the album, I got used to it, and found that my enjoyment of the album really increased. The songs themselves are mostly in the 5-8 minutes range, and are well written at that. You’ll hear several instances where the song starts on a moody, almost plodding pace, but builds to a climax where the guitars and drum kick it up a few notches to create a nice wall of sound, only to retract again. Calm Before the Storm is a magnificent of a song with ever changing moods and tempos. As I said before, the guitar work is outstanding throughout, and the epic, vintage “off to battle” atmosphere is captured perfectly here. Subtle keyboard textures are sprinkled throughout to enhance the mood, mostly in more mellow and dark sections. The only shortcoming I hear as far as songwriting goes are some weak chorus lines. The album is pretty much hit or miss in this department. You’ve got some songs like Vampire Killer, Dybim Tbar, and Sword of Crom that work really well to bring out the head banding air guitar player in you. On the other hand, some songs like Narsil and Siegecraft fail to leave a significant imprint in your memory due to some flat chorus lines. On the whole, this is a pleasing album for fans of this genre. Battleroar certainly have a ways to go before I’d consider their work of “masterpiece” quality, but despite some weaknesses, Age of Chaos is a solid album. I haven’t heard the debut album of this band, but I have heard that it lacks the power and production of this album. Having said that, it seems like these guys are improving as they continue to play. While I consider this album to be a solid album, there is potential written all over it for the band to become much more. Fans of this genre should certainly keep an eye on Battleroar.